Yes, not everyone is able to receive Holy Communion today, but everyone can proceed to the front to get the dirt. Today, our bodies, our foreheads in particular, become a blank canvas in which the Church wishes to paint the Truth of our identity, about who we are and who we wish to be, about creating something beautiful and unique with this soiled, dirty and messy paint of ashes and dirt. Today we are anointed, not with oil (the biblical symbol of gladness and celebration), but with dirt. It is a strange anointing. It is this cross that comes to mark us, as Lent begins. Ashes, dust, dirt: the stuff that we walk upon, that we sweep away, that we work to get rid of, now comes to remind us who we are, where we are from and where we are bound. The liturgy for the imposition of ashes contains three commands found in two different options – Remember! Repent! Believe! – each of which, together with that sign in dirt, says something important about human life and identity, and helps us understand our relationship with God, our destination in life and what needs to be done to get there. Memory plays a key part in the Christian faith. Believers are called to remember who they are and whose they are. The words, ‘Remember that you are dust’, direct us back to the very beginning, when God formed Adam, literally ‘the earthy one,’ from the dust of the ground and breathed into his nostrils the breath of life. Far from suggesting that we are sinful rubbish, the liturgy is reminding us, in the first instance, that we are creatures who depend on God for our very existence. We are not and cannot be completely self-defined. However much we might protest against the idea, we are creatures, and we are dependent on the God who made us. At the same time, this ‘dust-that-we-are’ has been created in the image of its Maker. How terrible and yet how marvellous, that God should feel so tender towards the dust as to create us from it, and return us to it, breathing through us all this while. The Ash Wednesday liturgy, thus, is a call to remember the wonder of creation, the miracle of existence and the gift of life, expressing humanity’s exuberance, joy, gratitude and praise, and recognising that we are not gods but creatures, subjected like everything else to the limitations of earthly existence. The truth about every living creature is that one day we will die. Accompanying this dirt and ashes, comes the invitation, the call, the command to ‘Repent.’ In the Old Testament, people often used ashes as a sign of repentance. They would sit in ashes, roll around in them, sprinkle them upon their heads, or even mingle them with their food and drink. They did this as an outward sign of their inward posture of repentance. Ash Wednesday begins Lent, a time when we stop and assess how we're doing in our walk with God. Lent helps us identify spiritual areas in which we can grow and sinful areas that we need to avoid. To repent, put simply, means to turn away from sin and turn toward God. But we acknowledge that repentance, or any change for that matter is never easy. The dirt on our foreheads would remind us that it is always a messy business. Change is difficult and it can be complicated, but it is worth all the trouble and the hassle once the change is complete. In other words as someone once said, “change is hard at first, messy in the middle, and gorgeous at the end.” If it was that easy to change the way we think or act, the world would be perfect. Consider change like a home renovation project. At first you to identify the areas that need to be improved. Once the process starts, things can get quite messy as old walls are torn down and new ones built, but the end result is something completely different and much better than what you started with. If you can stay motivated and overlook the messiness while changes are being implemented, then you will surely come out on the other side gorgeous and new, a better person for having gone through it all, as long as the changes that you make are positive. During this Lent, something challenging and transformative can take place, if you are willing to embrace the dirt of who you are and the grace of God that would make you beautiful. As the priest or the lay minister pronounces those words and marks your foreheads, there is a moment of confrontation, of combat and assault, in which a battle is waged for your identity and your soul. You are told the painful truth about yourself, and the sinful reality of our world. And you are called to Repent! Turn around! A new way of life is offered that challenges the dominant cultural pattern of your life. Having turned around, what would we discover? Believe! 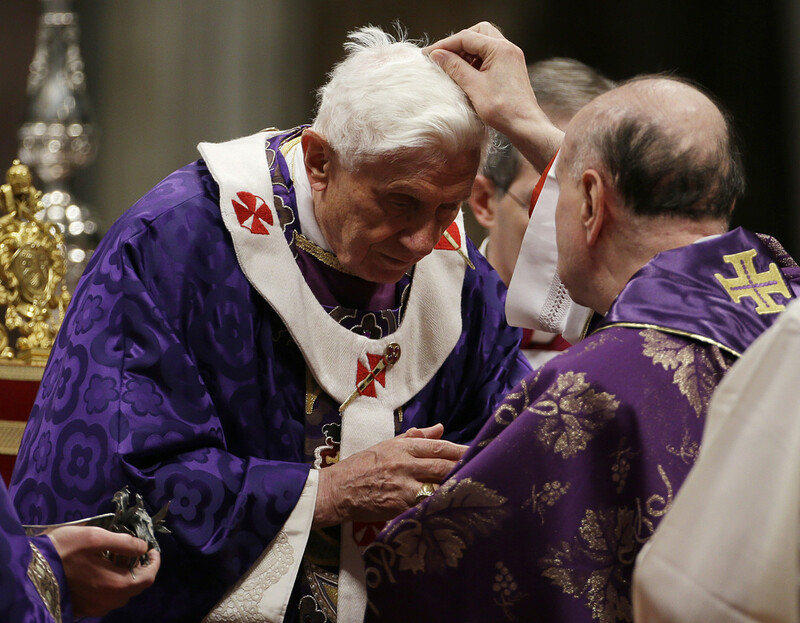 Ash Wednesday points to Jesus Christ as the true source of meaning and identity. It bears witness to beauty and wonder, even amidst the pain and struggles of life, the ashes of history, and it calls us to live with faith, hope and love, believing that Christ can change and renew us, just as He promises to do for all of creation. Believe entails hope. Ash Wednesday and Lent encourages us to hope. Sin and death does not have the final word. Beyond that is our redemption and the resurrection. Wherever we look in the modern world, hope seems to be in short supply. Ash Wednesday is the beginning of a momentous period that culminates not in a death on Good Friday, but with a resurrection on Easter Sunday. It is utterly aware of the realities of the human condition – aware of our fallen-ness, but it doesn’t leave us there. That cross of ashes with which the priest marks the believer, is not a morbid indication of death and corruption, but a lively sign of faith and hope. So today, everyone gets to receive the dirt on your foreheads. You don’t have to be saint to earn it. That’s because though not all of us have arrived at the pinnacle of sanctity, not all of us have attained perfection in our moral and spiritual cultivation, we find comfort in knowing that all of us do share something in common – our mortality, our sinfulness, and our need for forgiveness and redemption. “For all have sinned and fallen short of the glory of God.” Consider that, what we share in common as part of the human family, what unites us is our sinfulness. But there is more, because we are all sinners – the Lord has come to redeem us. That’s the good news. So, don’t be afraid to queue up and get all dirty. Wonderful dirt, marvelous dirt, redeeming ashes.